Knowledge Base » Propaganda » 2016-10-02 Excerpt from interview with winner of 2016 Pulitzer Prize, Vietnamese-American author Viet Thanh Nguyen. his book “The Sympathizer”. 2016-10-02 Excerpt from interview with winner of 2016 Pulitzer Prize, Vietnamese-American author Viet Thanh Nguyen. his book “The Sympathizer”. The interview by Eleanor Wachtel is far-ranging and informative. The audio link to the full interview, and more info from the website also appears below. Recommend: Do a web search. 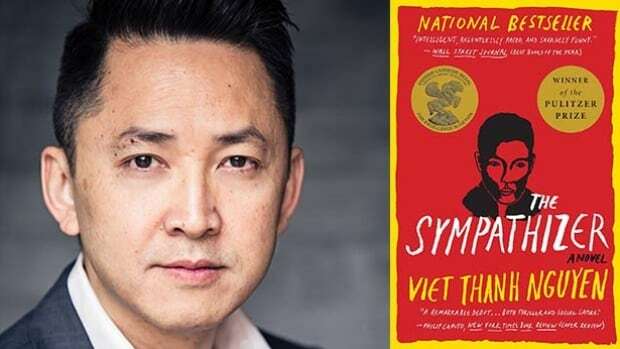 You will be blown away by what Viet Thanh Nguyen has accomplished – – a major contributor to the Good of the World. His ambitious, disturbing, and darkly comic novel, The Sympathizer, won the 2016 Pulitzer Prize. Viet Thanh Nguyen: I certainly grew up knowing that there had been a war and that it had shaped my family fundamentally. And that it was something that was a major issue not just for the Vietnamese people I was growing up among, but among Americans as well and there was no way to get away from that because it was so omnipresent in American culture. Wachtel: what did you take from the movies, for instance Coppola’s 1979 film Apocalypse Now ? Viet Thanh Nguyen: I took from it that obviously this war was enormously important for Americans; they were spending all this time making these movies and watching them. I also took from it that there was no place in this American imagination, this American memory and history for Vietnamese people like me. Or that our place was a very problematic place. It was to be killed or silenced or victimized but in any role we were there simply as a backdrop for an American drama. This was a very difficult thing to deal with because obviously growing up in a Vietnamese community we were not the backdrop of our own lives. The war was central to us. I always knew that this was actually also a crucially important war for us and that all the stories and emotions and subjectivities that I was witness to as a kid among the Vietnamese people were not being heard or seen or understood by the larger American community. And how Americans saw this war was also in many ways how the world was seeing it because of the power of American culture and the way that American stories were disseminated because of that power. Wachtel: Yes because unusually as you point out, here history was written by the losers. Viet Thanh Nguyen: Yeah, this is one of the ironies. I think it has to do with the unique nature of the United States and the wars that it has been fighting since WW2 or the Korean War. Basically the U.S. is a global power after WW2 and it’s fighting all these wars. It hasn’t won a war since WW2. Korean War was a stalemate. Vietnam war was a defeat. Every major war since then can hardly be declared as a victory. What this means is that even if the U.S. doesn’t win wars its global power, its military power, combined with its economic power and its soft power through Hollywood and the public culture industry means that it can tell its own stories in its own ways and spread them all over the world and everybody all over the world has to confront them because that’s how pervasive American culture is. Wachtel: even the naming of the war. To North Americans it’s called the Vietnam war but in Vietnam it’s often referred to as the American war and you say that both are in fact misnomers. Viet Thanh Nguyen: Yeah, they both are. The war involved more than just the United States and Vietnam It involved Laos and Cambodia. These countries were not just postscripts or sideshows; they were equally involved in the war. They were devastated by what happened and both Vietnam and the U.S. were responsible for extending the war into these two countries, along with China and the Soviet Union. So it was also a global war. This was a hot war taking place in the middle of a cold war. All these countries were meddling in this region. Laos and Cambodia paid the heaviest prices for what happened. But for the Americans to call it the Vietnam War and for the Vietnamese to call it the American War means that both countries can forget what happened to Laos and Cambodia. It serves both their interests to forget. Viet Thanh Nguyen was born in what was previously known as South Vietnam in 1971. Four years later, after the fall of Saigon, his family was forced to flee to the United States as refugees, eventually settling in California. His first novel The Sympathizer, is an ambitious, disturbing novel that explores the aftermath of the Vietnam War through the eyes of a Communist Party spy who escapes Saigon for California, where he carries on his double life through assassinations and the making of a Hollywood war film. The Sympathizer, was on 30 “best of the year” lists and won numerous awards, including the 2016 Pulitzer Prize. Nguyen spoke to Eleanor Wachtel from Los Angeles. By 1978 Vietnam was a poor country. People were starving, there was a lot of desperation and the victorious Vietnamese government was persecuting people who had been affiliated with the defeated regime. People started fleeing the country, and for most people — tens of thousands of people — their only option was to flee by boat. It was a huge issue for the Vietnamese refugee community to see their compatriots going through this horrible experience. There are some estimates that half the people who took to the seas by boat didn’t make it to their destination. So as a boy, I was aware that the rest of the world saw the Vietnamese people in this way, as victims of war and as “boat people,” as the press labeled them. But this seemed really inadequate to me, because I knew the complexities of Vietnamese life and I knew that thinking of them as “boat people” automatically was demeaning. It brought pity to them and in some cases helped to rescue them, but it was also a way of relegating them to a really abject status. There had to be another way to think of these people. So I choose to think of them as heroic. They undertook a really risky journey, knowing that these were the odds, and to see them purely as victims was woefully inadequate. So I try to contest this term, try to get readers to think about what it was like to be a refugee. And obviously while writing that, I was cognizant of the fact that we’re still seeing refugees today, and that much of the rest of the world, when they look at refugees, they continue to see them as abject victims. I think this experience of having people separated from their families and having families divided is actually not that unusual. Many Vietnamese families that I know endured similar kinds of experiences. In some cases, families were able to reunite, but sometimes they remained divided for decades. My father didn’t see his siblings for 40 years, from 1954 until the early 1990s, when my family returned. My mother didn’t see her family for 20 years, and they didn’t see my adopted sister [who stayed in Vietnam to watch the family property when the rest of the family fled to the U.S. in 1975] during that time either. We didn’t talk about it. It was a very sensitive subject. Even today, my parents don’t really talk about it. I was growing up in San Jose in a Vietnamese household. My world, domestically, was all about Vietnamese people. But then I had to venture out, to go to school, and I watched American movies and TV shows in my free time. So that was my exposure to American culture. It was a very bifurcated kind of existence, and I think that was actually very common for people of my generation. We had to live in these two worlds. Our parents and our grandparents were not living in the American world — they were trying to avoid it as much as they could. I was intimately familiar with the Vietnamese world, but at the same time I was also intimately familiar with the English-language world. So no matter where I was, I couldn’t help but bring that other world with me. Of course I would understand the customs, the history my parents were trying to relay to me. But at the same time I would also look at them as if they were foreign, because I couldn’t help but see them through the eyes of what I imagined the American world to be. Viet Thanh Nguyen’s comments have been edited and condensed. Music to close the interview: “Một cõi đi về” composed by Trịnh Công Sơn, performed by Diva Viet. 2015-09-24 Urgent action needed to combat online (“cyber”) violence against women and girls, UN report 2016-10-05 Things Fall Apart, author Chinua Achebe. Insights re violence in our communities.